This course is designed for those who want to pursue their career in the field of jewellery. The course is planned for 13 months which covers the subjects like Diamond Grading, Jewellery Designing, CAD designing and Gemology. 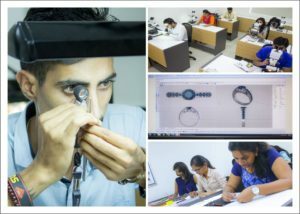 This course is designed to educate students with knowledge and expertise in all the aspects of the jewellery that is required to get into the industry/business. This course helps in giving the total exposure of jewellery market by providing internship and placements in known firms, which will further help them to understand the advance course much better. At the end of the course Students are certified and graduated in diploma through exams.